We are in MAUI right now! 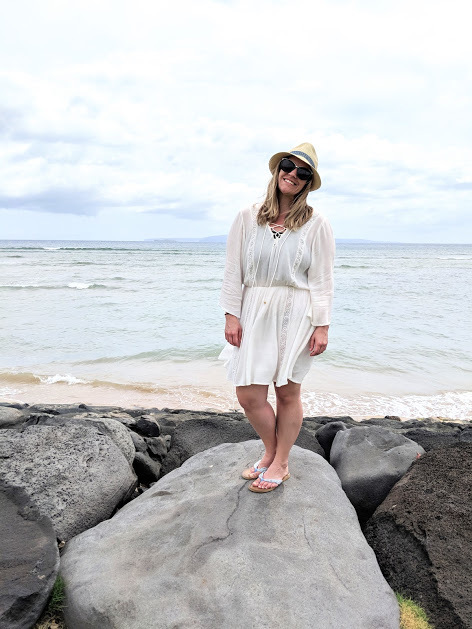 So I thought it fitting that today I could share a post all about our LAST trip to Hawaii. My best friend made the absolute best decision ever and had a destination wedding in HAWAII. She got married on the naval base in Honolulu, and it was absolutely perfect in every way. In addition to being able to stand with my best friend as she married her sweetheart in paradise, my entire family came too, and we got to spend a week on the island! We spent the first 3 days in Honolulu for the wedding then rented a big house for all of us on the North Shore. Here are a few of the things that we did and saw and ate. In Honolulu, we went to Pearl Harbor, which was truly a special experience and so sacred. If you have the opportunity to go, please take it. It was wonderful to be able to honor and pay respects to fallen soldiers. Jason made a video of our experience at Pearl Harbor. This was a pretty short and easy hike, and the view was INCREDIBLE and worth the few minutes and not great parking. There’s no parking lot, so you have to park on the street near the starting point of the hike. Either way, don’t let anything stop you from seeing the view at the top of this hike! You can see video of the hike here. They are kind of everywhere on the North Shore, but we stopped at this one and it was obviously the best idea because we got to chatting and they gave us an unofficial tour through their backyard, aka, fruit farm. It was seriously one of the most magical parts of my trip. I loved seeing that part of the culture and listening to her stories of her family and how the home had been theirs for generations. So if you can chat and make friends with one of the friendly fruit stand locals, I definitely recommend it. As you can see, she loved us too 😉 Jason made a fun video of our adventure on the Hawaiian fruit farm too. We spent an afternoon here and it was beautiful. It was a super easy paved walk to the falls through luscious green Hawaiian jungle. They had a cute gift shop and restaurant at the entrance. The falls were so pretty and although there were some people, it was not too crowded. Oh also exciting, we saw a van that said Hawaii 5-0 and my dad is a HUGE fan, so of course we got excited and stopped. It wasn’t 5-0 shooting, but they were shooting Snatched with Goldie Hawn and Amy Schumer! No sightings though, bummer lol. Jason and I belong to the LDS church and so we couldn’t pass up at least stopping by the breathtakingly beautiful temple in Laie. And that it was! So so so beautiful. Not much more needs to be said, just take a look. Because we were there for the wedding, so many of our meals were taken care of which was so nice. That means that we really didn’t eat out that much in Honolulu though. So most (all) of our meals were on or towards the north shore. GIOVANNI’S SHRIMP TRUCK If you only go one place to eat (I hope that’s not the case) go here! I still daydream about this shrimp. So so so good. BEACH HOUSE RESTAURANT We went here for our one super nice dinner out, and it did not disappoint. The prices were really good for what you got. The chocolate cake alone is worth it, no one at the table could stop talking about it. And the view and ambiance. The inside is completely open to the outdoor patio. It was a beautiful and tasty restaurant. TED’S BAKERY Jason and I snuck off and went to Ted’s on our own and it was SO worth it! They had the most tender and delicious chicken, and we got a slice of the chocolate haupia cream pie – don’t miss this! We also brought a macadamia nut cream pie back to the house for the fam, and they weren’t sad about it. Other than the things mentioned, we spent a lot of time playing in the clear blue waters and lounging in the warm sand. What are YOUR favorite Oahu tips?! Tell me in the comments. I’d love to add them to our list for our next trip!